DAY’S END. 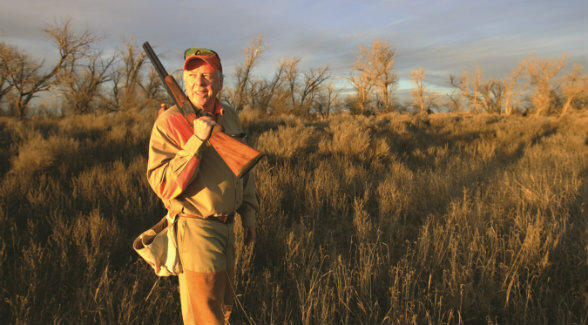 In 1971, the lifelong bird hunter bought the first 2,940-acre parcel that would become his beloved Mesa Vista. Growing up in Holdenville, Oklahoma, I once walked five miles from town down to the banks of the Canadian River – and back – to earn a Boy Scout merit badge. Today, some 80 years later, that very same Canadian River remains a fixture in my life. It forms the northern boundary of my 65,000-acre Mesa Vista Ranch in the northeast corner of the Texas Panhandle. The ranch’s name is a tribute to the stunning mesa views across the Canadian that signal the southern edge of the Great Plains. Years ago, at a high school commencement speech for my grandson, I offered to trade the Mesa Vista (and my jet and my billion-dollar bank account) to any graduating senior. There was a catch. They got my ranch and the G-V and the money, but I got their future. Sounds like a helluva deal, and it was. For me. Today, however, trading my ranch is off the table. But selling it is not. I’m officially putting it on the market. Asking price: $250 million. Selling the Mesa Vista is the prudent thing for an 89-year-old to do. It’s time to get my life and my affairs in order. There are many reasons why the time is right for me to sell the Mesa Vista now, not the least of which is to ensure that one of the most magnificent properties in the world ends up in the hands of an individual or a group of buyers who share my conservation ethic. Reflecting back on my career, one of my keys to success has been an ability to accept and embrace change. That has been especially true in the fourth quarter of my life. Several years ago, my longtime personal doctor said he had good news and bad news for me. “Shoot straight,” I told him. “Well, the good news is you’re going to live to be 110. The bad news is you won’t be able to hear or see in three years,” he said. “Hell, I’m already there,” I countered. Slowly but inevitably, my fading vision and limited hearing have forced me to give up things I’ve loved and excelled at — golf and hunting, in particular. Although the beauty of Mesa Vista remains intact, the ranch roads I have driven thousands of times are now blurred. Can I hear a flock of turkeys noisily roosting in one of the cottonwoods by the Lodge? Of course I can. But can I pick out a single gobbler? Probably not. It’s time to embrace and accept that my life has changed. 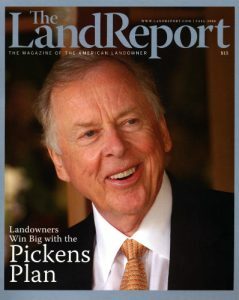 Pickens and his good friend Ted Turner have both graced the cover of the Magazine of the American Landowner on two occasions. My hopes for the Mesa Vista and my plans for its future remain as vivid as they were when I began assembling the ranch 46 years ago. 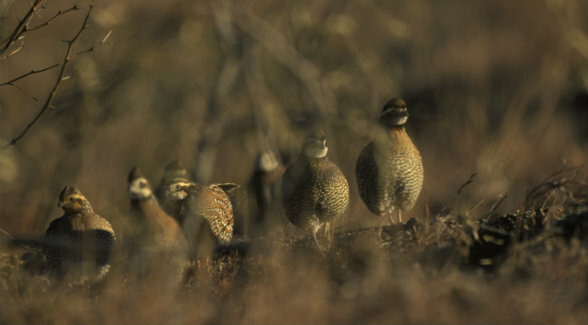 I initiated a multi-decade program to help the land heal and, over time, invested millions of dollars on wildlife management programs and facilities to create what many believe is the best quail hunting in the world. We have minimal cattle grazing on the ranch, preferring instead to let the land revert to pristine prairie conditions much as it had been in centuries past. And the Mesa Vista is water rich in ways I am hard pressed to convey. Roberts County sits over the Ogallala Aquifer, the largest groundwater reservoir in the US and one of the largest in the world. The Ogallala spans eight Great Plains states and covers some 174,000 square miles. This reservoir is estimated to contain over three billion acre-feet of water, and it stretches from south of the ranch near Midland clear up to South Dakota. That’s enough water to cover all 50 states 18 inches deep. It shouldn’t surprise you to learn that my ranch is the only place I’ve ever drilled that I had never had a dry hole. We hit water every time. Thanks to this God-given gift, the Mesa Vista is blessed with miles of creeks, acres of wetlands, and nearly 20 lakes of varying size. In addition, the ranch’s water rights total approximately 42,000 acres. That means the next owners of the Mesa Vista will be able to utilize 42,000 acre-feet of water per year as they see fit. And that includes selling it on the open market. In 1971, when I bought the first parcel of what would become the Mesa Vista, there was only one structure on it: a tiny metal building that was used to store blocks of cattle supplement that ranchers call cake. So we called it the Cake House. And when it got really cold or the wind picked up, I’d grab my bird dogs and we’d duck inside. We wouldn’t get warm; we just weren’t near as cold. A lot of things have changed since then. Ae Mesa Vista has grown from 2,940 acres to almost 65,000 acres. That’s more than 100 square miles. And the accommodations we’ve built are first rate. The Lake House is one of the many world-class improvements that have been built on the Mesa Vista. 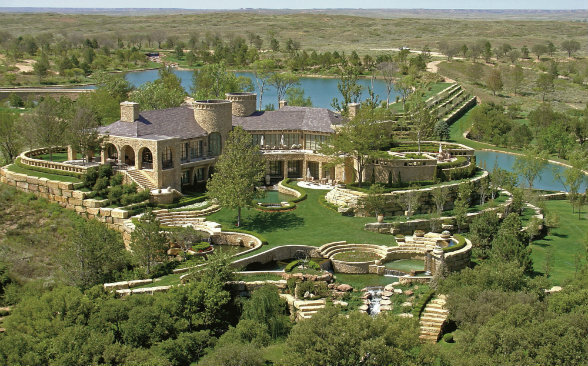 Crafted from Lueders limestone, it totals 12,000 square feet indoors and has 4,000 feet of porches and patios that offer stunning views of the Texas Panhandle in all directions. There’s the Lake House, a spectacular 12,000-square-foot getaway with 4,000 additional square feet of porches (above). With 33,000 square feet, the Lodge hosts much larger groups. It has a huge great room, an expansive media center, my library, and several dining options. The 6,000-square-foot Family House is completely self-contained and is a short walk to the Lodge as is Ae Pub. The Gate House is a short drive away. My bird dogs are housed in a 12,000-square-foot kennel, and we built a 6,000-foot runway with its own 25,000-square-foot hangar. There’s a lovely chapel that has a glorious view of the mesas and has seen marriages and, sadly, funerals. Staff housing is spread out all across the ranch. Some of the numbers associated with the improvements are substantial. Here’s a for-instance: nearly 16,500 semi-loads of materials were required to construct the buildings I just mentioned. I personally directed the placement – or replacement – of 20,000-plus trees. Mesa Vista Ranch’s unique combination of pristine prairie and world-class amenities have provided an unparalleled venue for some of our nation’s most influential political and business leaders to share their insights on matters of critical importance to our times such as national security, economic policy, energy issues, and philanthropic investments. The Mesa Vista has been a labor of love that has occupied the better part of my life. And I intend for a lot more good to come from the sale of the ranch. To date, my charitable giving exceeds $1 billion. Much of the proceeds from the sale of my ranch will be directed to The T. Boone Pickens Foundation to fund a variety of philanthropic and charitable commitments. 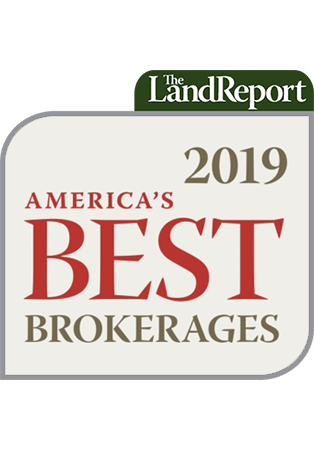 I see the marketing and sale of my beloved ranch as a new beginning – for the Mesa Vista’s new owners, for the recipients of my charitable giving, and, yes, like it or not, for me. Monte Lyons of Hall and Hall Ranch Partners and Sam Middleton of Chas. 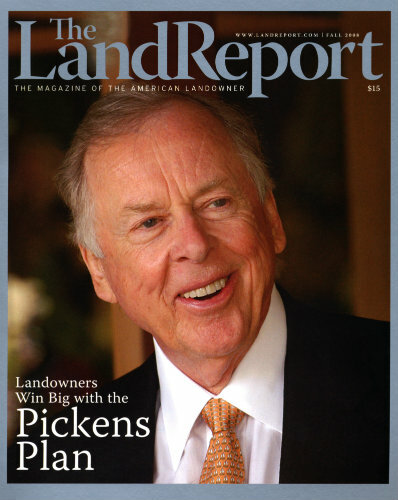 S. Middleton and Son have been selected to represent T. Boone Pickens in the sale of the Mesa Vista Ranch. For additional information, go to: www.hallhall.com & www.chassmiddleton.com.